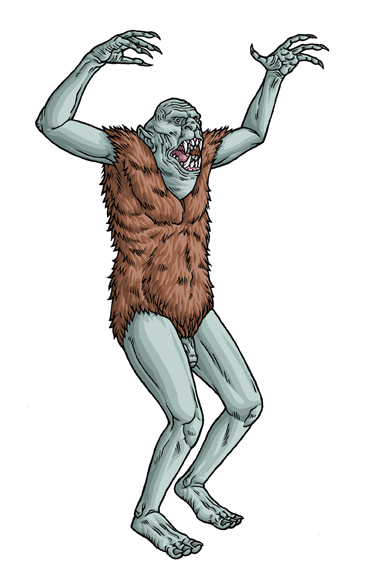 I posted a while back on the Hyperborea Boards about Vhuurmis and Ape-Men. As presented in AS&H, I didn’t see much difference between the two species, and I asked whether Ape-Men and Vhuurmis were redundant. I see the difference as this. Vhuurmis are apish creatures that once ruled Hyperborea and were *this* close to becoming true men. Then the Hyperboreans came and drove them into the darkness, where the Vhuurmis degenerated back into sheer savagery. But they still have some ancestral memory and resentment of their lost status, and hate mankind for it. Ape-men, on the other hand, are apes who aspire to one day become men, or at least to mock men. Almost the opposite of Vhuurmis, really. I’d further differentiate the Vhuurmis by declaring them sexually incompatible with humans. While Ape-Men hybrids do exist, there are no “Half-Vhuurmis” in my Hyperborea. Also, the number of fingers and toes that a Vhuurmis possesses is highly variable. This entry was posted in Astonishing ACKS, Campaign Setting and tagged ACKS, ASSH, Hyperborea, RPG, Simians, Vhuurmis. Bookmark the permalink.